My earlier blog posts on copyright, the serials crisis and Open Access may have give the impression that large commercial publishers are the natural antagonists of librarians; that librarians are the heroic, under-resourced champions of access to information that would otherwise be locked and bound behind a labyrinthine network of paywalls, copyright law and restricted permissions. This is, of course, largely untrue: the researcher, the publisher and the librarian are all integral parts of the information communication chain and are therefore in a symbiotic relationship with each other, even if one group’s needs and goals have the potential to cause tension with those of another. It is important to bear in mind that innovations such as Creative Commons licenses and Open Access publishing are not completely revolutionary, as they merely form a legal superstructure on an existing foundation in the case of the former and shift the payment structure within the existing publishing framework on the other. And whilst librarians may face financial problems caused by the high price of subscriptions to academic journals, it must also be remembered that the publishers themselves are facing huge challenges for a variety of reasons. These include technological developments in how books are published and read—most obviously the ascendancy of the e-book—business-model challenges from internet giants such as Google Scholar’s digitisation programme and Amazon’s print-on-demand service, and societal changes in what is being read (witness the popularity of the Fifty Shades of Grey series, which was originally written as fan-fiction). Technology in publishing, how it is implemented and how it is used is increasingly the differentiator—not the content!—between the publishers that will succeed and those that will fail. In other words, publishers must stay on top of the latest technological developments, or they will go out of business: evolve or die. In practical terms, this process has extended from the automation of backroom publishing (already largely completed, from computerised typesetting through to algorithmically-driven distribution), through the digitision of content, to the increasing personalisation of marketing and user-centred material through analytics programmes such as this soon-to-be released service offered to publishers by Jellyfish, described in terms that cover the current data mining zeitgeist, as “Google Analytics for e-books”. To reinforce the plethora of possibilities being pursued by publishers at present, we also had a guest lecture from Dan Franklin, the Digital Publisher at Penguin Random House UK, the British section of a global conglomerate formed recently by the merger of the two historic publishing houses in 2013. He emphasised that, as the digital publishing industry reaches a stable state of maturity (to the point at which the very term becomes a tautology, as publishers now include it within their overall publishing strategy in all forms of media), it is important for publishers to fully interact with the new and constantly-evolving technology available in order to maximise readership, which both increases information consumption (and therefore, hopefully, knowledge) and the companies’ commercial viability in an era which has been influenced hugely by the expectation of free content engendered by the development and growth of the Internet. He also picked out the music and entertainment industry, which has a long history of resisting change for fear of losing revenue, only to suffer in the longer-term as a result. Franklin also took us on a whistle-stop tour of some of Penguin Random House’s current digital projects, including YourFry, a digital storytelling project to create a crowdsourced biography based on the memoirs of Stephen Fry; new e-reading websites for Penguin’s Pelican and Little Black Classics imprints; the use of other forms of media such as podcasts and films to attract new readers; technological changes such as the creation of a template for building recipe e-book apps; and the use of social media websites such as My Independent Bookshop to improve the user-centred, personalised experience for consumers. The message is clear, and also applicable to libraries (for example, the website LibraryThing is a clear parallel to My Independent Bookshop): innovate or become irrelevant. The LAPIS module has, up to now, taken us on a very broad and philosophical journey, asking us to consider questions like “what is an author?”, “what is an authorial work?”, and “what is copyright?”. The fifth lecture of term applied some of these questions and general themes to the narrower and more focussed field of scholarly publishing and its effect on libraries. Scholarly publishing is distinct from trade publishing, in that it aims to provide resources for research and advanced study rather than merely turning a profit (although this remains an important consideration!). It dates back to the 1660s, with the Enlightenment-era formation of the first learned societies and the publication of their activities in serial form. The oldest English scientific journal is the Philosophical Transactions of the Royal Society, which was first published in 1665. This format of scholarly publishing continues to the present day; the number of academic journals has increased steadily at about three per cent every year to a current total of approximately 25,000, most of which are marketed primarily at academic libraries and other large institutions, instead of individual customers. This has created problems for librarians, particularly those who work in academic libraries: as the number of journals has increased, it has become more and more difficult to afford access to those necessary to sustain a scholarly, research-orientated institution–a particularly severe problem for those institutions that exist in the developing world. Most current academic journals are published on behalf of their societies by commercial publishers, although university presses and not-for-profit organisations are still part of the market as well. We referred to two related articles from the journal The Serials Librarian, both of which emphasise the financial risk taken on by a publisher that establishes a new journal: this has led to the widespread practice of “bundling”, whereby a large academic publisher such as Elsevier, Springer or Wiley sells a large collection of journal titles–some highly desirable, others less so–as an inclusive package, thus using its more successful journals to subsidise the rest. This has further increased the financial pressure on the acquisitions budgets of academic libraries, as the price of journals subscriptions has consistently increased faster than the general Consumer Price Index since the 1980s. 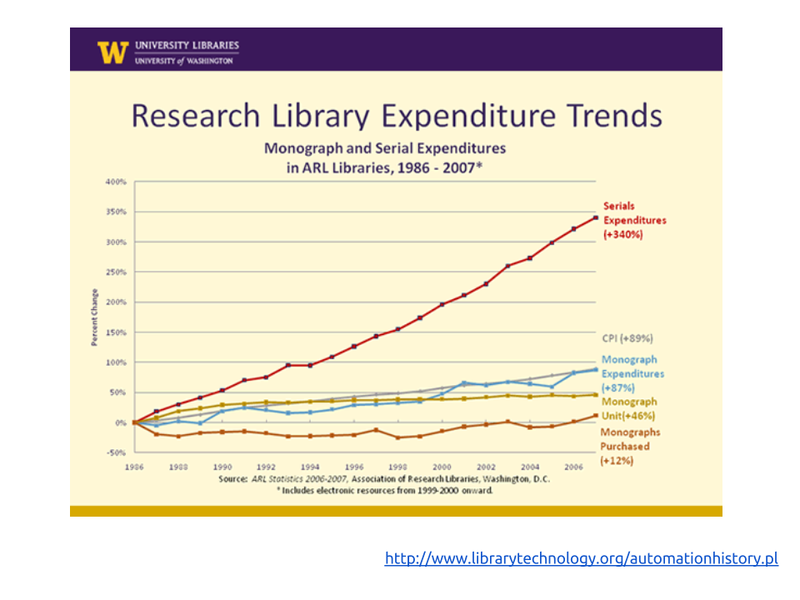 An example of the effects that this phenomenon—popularly dubbed the “serials crisis”—can be seen in this (American) Association of Research Libraries survey of changes in library expenditure by resource from 1986 to 2007, showing a 340% increase in expenditure on serials, compared to an 89% increase in the CPI and a lower figure for every other type of resource. The resultant growing backlash to the large commercial publishers’ models has taken many forms, from petitions and campaigns against individual publishing houses, new, less restricted forms of copyright licensing, and all the way through to the Open Access movement, which we will cover in more detail in future lectures. A cartoon by Giulia Forsythe that demonstrates the strength of feeling against the Dutch publishing giant, Elsevier, amongst The Cost of Knowledge campaign. The session also featured a guest lecture from Suzanne Kavanagh of the Association of Learned and Professional Society Publishers (ALPSP), which supports these groups—which are often small and under-resourced—in this demanding environment, between commercial publishers on the one hand and the stretched resources of libraries and other customers on the other (not to mention the challenges caused through ongoing technological developments, causing changes in turn in both traditional reading habits, and also the rise of new scholarly publishing paradigms being developed by corporate megaliths such as Amazon and Google) by providing a number of support services: information, advocacy and representation, professional development and opportunities for networking. The lecture helped remind us that the issues that we discuss in lectures are not just philosophical or theoretical, but that they also affect entire real-world industries. Our third week of LAPIS continued to explore the wide-ranging philosophical concepts of authorship, and the socio-cultural effects of how these concepts have changed over time. We also benefited from a guest appearance from The Guardian’s commissioning editor, Eliza Anyangwe, to offer a journalist’s perspective on current issues of authorship and publishing, which proved to be a useful addition to our existing LIS paradigm. One of the major themes discussed was how the greater access to information that has taken place throughout human history, and particularly over the last twenty years with the development and exponential growth of Internet communications, has blurred the traditional distinction between “author” and “audience”, and led to a far more participatory culture. A sketch by H. P. Lovecraft of Cthulhu, his most famous literary creation. The American author H. P. Lovecraft is best-known for his works of fantasy-horror, exemplified by his conception of the Cthulhu Mythos (pictured above), but he also wrote essays and letters on a number of subjects, including one on amateur journalism. Written circa 1920, much of it seems quaint: much of it is concerned with the potential decline in quality when journalism is carried out by amateurs rather than professionals, whereas citizen journalism is an accepted part of the modern profession. (A notable recent example is that of Daniel Wickham, whose Tweets exposing the hypocrisy of many of the world leaders who attended the recent Charlie Hebdo memorial in Paris were subsequently widely reported by the “mainstream” media. Above all, let mutual comment be encouraged. We should make it virtually a rule to see that as many articles as possible receive printed replies. This anticipates the widespread (albeit not universal, and still much-debated, practice) of news outlets allowing members of the public to make comments on their online articles, one of the key elements of modern media culture. We also discussed the essay What is an author? by the philosopher and cultural theorist Michel Foucault, whose definition transcends the simple definition of simply the person who produces an artistic or intellectual work, but is instead “a certain functional principle” which is shaped by societal influences that have the potential to stifle his or her output by circumscribing it within established conventions and received knowledge. This led us to the very recent, and similarly-titled essay What is an @uthor? by Matthew Kirschenbaum, which updates many of the questions raised for the contemporary digital age. Kirschenbaum compares William Faulkner with the contemporary author William Gibson: Faulkner was a pioneering figure in the communication of literature, as he allowed a series of classroom conferences he held at the University of Virginia to be recorded and published; Gibson is a current example of this approach taken to extremes, with the entirety of a recent book tour recorded, in addition to frequent interactions with his audience through social media such as Twitter. The question that Kirschenbaum raises is simple: when studying contemporary authors, is it now to be expected of the researcher that he or she must trawl these extensive digital archives in search of illumination on a particular subject, in addition to the author’s works themselves and the standard additional sprint sources of information? “Unofficial” fan-art (by Spankeye on DeviantArt) of Cthulhu – is it a less valid interpretation as a result? Or does “ownership” transcend the concept of an individual author (in spirit if not in law)? A key part of authors’ use of social media is their direct interaction with their audience, and this raises the additional questions that surround fan, or participatory culture, and whether or not the audience can, in effect, secure “ownership” of an artistic or intellectual creation over its original author. A relevant example is the current Star Wars Uncut project, which aims to remake the original Star Wars trilogy with each scene shot by a different group of fans. 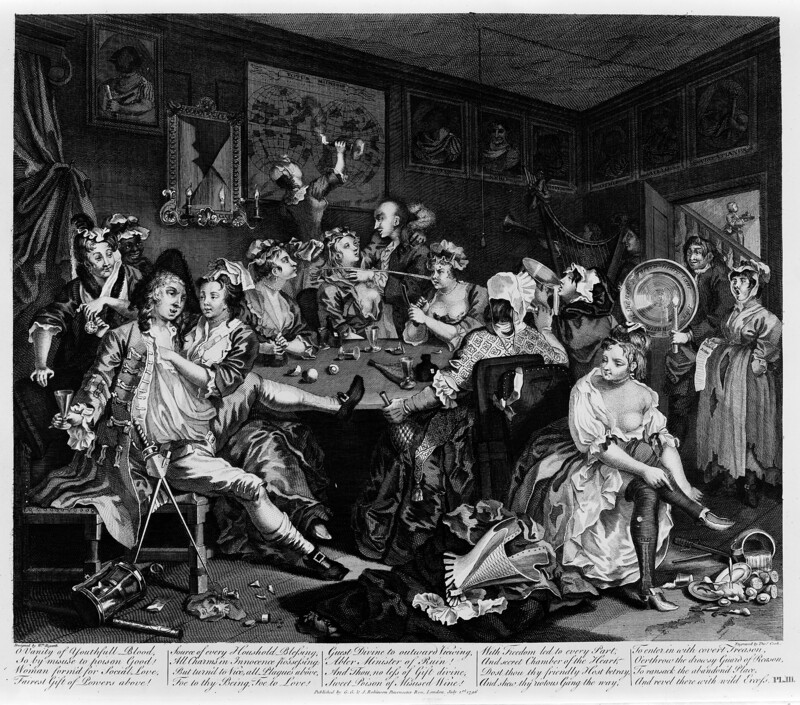 To many of us in the lecture, this seemed like a new and rather indulgent form of artistic expression, but we were then asked to consider if the underlying concept was really so very different from an established, artistic form, the parody? And is the desire to film this project perhaps borne out of frustration about the subsequent direction of the franchise under George Lucas and, latterly, Disney, and therefore a (possibly subconscious) attempt to claim “ownership” of the original films? Eliza’s lecture on contemporary trends in journalism raised many of the same points, and emphasised the fact that, outside the theoretical discourse of the lecture theatre and in news agencies across the world, there is a greater reliance than ever before on the traditional, professional side of the discipline being supported by the work of amateurs, essentially “fans” of newsworthy stories. She concluded that there is currently a choice between two models in the journalism sector: first, a culture in which everyone is encouraged to contribute content and everyone can view the news agency’s output, the drawback of which is that it may not be economically sufficient; and secondly, a subscription-based model which restricts necessarily participation and access, but may provide a more solid financial basis providing that the agency’s reputation is already high enough to encourage readers to pay for content. Something tells me that we will encounter the choice between these models again throughout the LAPIS module! In our second LAPIS lecture of the term, we continued to discuss the philosophy and history of publishing. In a continuation of last week’s discussion of the distinction between form and content, inspired by Walter Benjamin, we discussed the works of the Canadian philosopher of communication and media, Marshall McLuhan. One of McLuhan’s best-known ideas is that “the medium is the message”, as expressed in his 1964 book, Understanding Media: The Extensions of Man: that the medium through which content is communicated is of greater importance to society than the content itself. This is because different forms of media cause different social effects due to their inherent characteristics: for example, content that is communicated by radio is consumed in a fundamentally different way from content communicated by television, or the print media. The video below features McLuhan elaborating on his theories in a televised question-and-answer session. The idea itself is now over fifty years old, yet has retained its fundamental importance as one of the cornerstones of modern media theory. It continues to remain relevant, as new forms of communication media continue to emerge; most obviously those associated with the growth of the Internet. One notable trend of recent years is the growth of media which demand extreme brevity on the part of those who transmit messages, for example the 140-character limit of Twitter or the six-second video loops on Vine. The growth of the Internet leads me in nicely to another important lecture topic: disruptive innovation. A concept that originated with business professor Clayton Christensen, it refers to a new technology that at first disrupts, then later completely supersedes its predecessor, whilst retaining some of its main identifying elements and hence resulting in long-term progress. The publishing sector has been severely disrupted by the emergence and growth of Internet-based technologies—notable examples include the development of self-publishing as a viable business model, the development of e-readers, and the replacement of traditional encyclopaedias and reference sources with free, crowdsourced alternatives such as Wikipedia—and we will explore the wider effects of this disruption upon society, and how the publishing sector is reacting, in future lectures. One important societal shift caused by the disruptive innovation associated with the Internet that we briefly touched on appears to be the development of a Sharing Economy from the earlier Knowledge Economy model first espoused by Peter Drucker in the 1960s. Drucker argued that modern society consisted mostly of knowledge, rather than manual, workers, and that this preponderance had significant ramifications for society. The Sharing Economy takes this approach one step further: now that information is recognised as a commodity, and that this commodity has never been so easy to share, it follows that its value increases for everyone when it shared. This in turn has redefined publishing, according to John Feather, as “the commercial activity of putting books into the public domain”. This naturally has a wide range of repercussions, as we will again investigate later in the module. It has been my intention to keep this blog running, even though the module for which it was required is now finished. Hence I have changed its name, in order to remove the specific reference to the Digital Information Technologies and Architectures module, and promoted a modified version of the original subtitle (“Welcome to the Library of Tomorrow!”) in its place. I have chosen to do this because I think that this blog has, in its brief existence so far, covered a number of areas which are at the forefront of current LIS research, and I intend to keep it that way (although I remain partial to whimsical historical digressions as well). I am also interested in researching the futurology of the discipline for my dissertation later in the year – more on which later. The second term of my course’s lectures begins tomorrow, so please stay tuned for more posts soon!